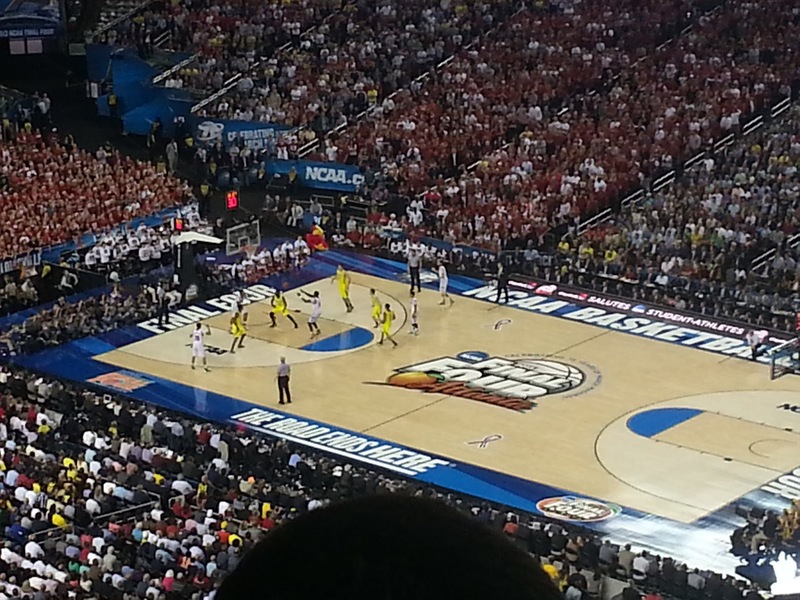 I bought tickets last week to the Championship Game and I can say it was well worth it. The game last night restored my faith in good college basketball. 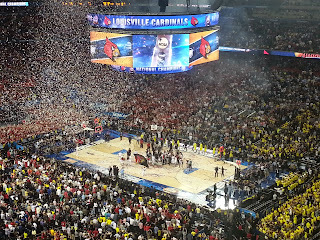 2 great teams slugged it out for 40 minutes with Louisville doing just a little bit more in the end to win it 82-76 (I didn't closely read the post so excuse typos/errors for now). As you can see it was not the best seat in the house, but I could see everything just fine. Actually, the camera (Samsung S3) doesn't zoom to what I could see with my own eyes, but the pictures work. The crowd was raucous... we were sitting behind and next to some young Michigan fans . Normally I have a heavy disdain for all fans Michigan, but they were having fun and not acting like the Michigan fans I have encountered over my lifetime. I didn't realize how many Louisville fans were behind me until late in the 1st half. Overall I'd say it was a 60/40 Louisville crowd. 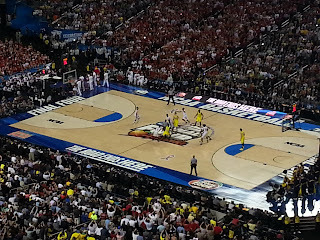 About the game... Michigan got off to an early lead, bouncing the lead as much as 12. At one point #2 (Albrecht) for Michigan was 6/7 and 4/4 from 3 as Louisville barely outscored him 21-17. I believe he was the same kid that pretty much owned Florida in the Elite 8. Then Louisville made a comeback thanks to Luke Hancock and briefly took the lead for the 1st time late in the 1st half (briefly), before Michigan hit 2 FTs to take the 1 point lead at the half. 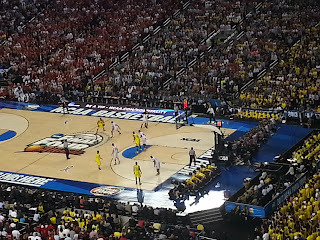 The 2nd half was some of the best basketball I've seen all season. Back and forth, Louisville and Michigan traded the lead until late when Louisville got up by 10. Michigan rallied to get it down to 4, but in the end Louisville made some big plays to win it. Siva was an integral part in Louisville's resiliency as he seemed to be able to get to the basket at will. I'm not one to complain about officiating, but the crew calling the game tonight was at best inconsistent. The 1st 10 minutes they let the players play, but after that started calling tic-tac fouls. It was like that the entire 2nd half... which probably confuses both the coaching staff and players as they have no idea what kind of a game is going to be called. I thought Michigan got the better end of the tight officiating. Anyways, it was my 1st NCAA Final Four. I hope one day to see Alabama there (not the NIT one), but the older I get the less I believe it will ever happen for us. I think we are a LONG WAY from that right now. I'll let this post sit here for a couple days before I do my end of year review on the team, coaches, etc. Moussa gueye to transfer, Alabama slated to start the season with 10 scholarship players as of right now. Will someone explain to me why the heck we have so much attrition? I know Moussa is not very good, but no player should be expendable with our complete lack of depth. We will have one senior for the third year in a row. I thought next year, we were supposed to have depth. Grant and staff, need to put down their outrageous paychecks for a second, and go sign another player or two. It would be very much appreciated Coach Grant. I am trying to get behind Grant and this program, but if you are wondering why many fans (including myself) see Grant as in over his head, and incompetent to run a major college basketball player, look no further than the fact that we start the season two or three players under the scholarship limit every single year. As for last nights game, it was a well played game between imo the two best teams in the country. The refs were awful, again, but at the end of the day the best team in the country won the national championship. Kudos to Louisville.